Chickpeas. Indian spices. Tomatoes. Chilies. Onions, garlic and ginger. Sound good? It is. This isn’t the most conventional chana masala but I’m going by the literal translation so I think I’m safe. It’s a South Indian spin on a North Indian classic. 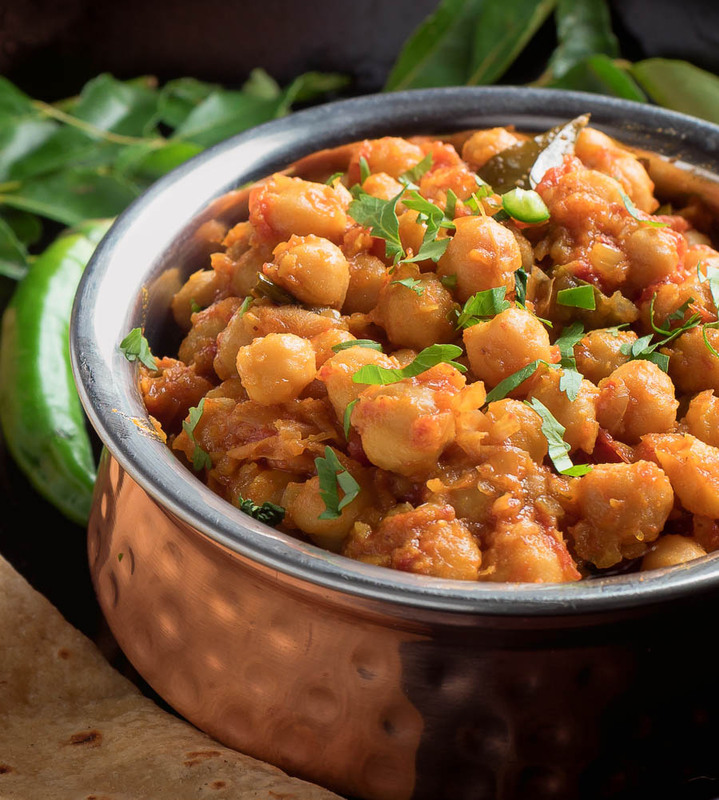 Chana is Hindi for chickpea and masala means spiced or spice mixture. This is chickpeas. It’s well spice. So I’m calling it chana masala. I think I’m safe. It’s really not that far off a conventional chana really. It’s not in your face spicy. Balanced. A nice counterpoint to a big lamb curry. Any curry really. Or no curry. It stands alone as a vegetarian main. The only big twist is the fresh curry leaves. Adds a South Indian flair. A new taste. Surprising. Surprisingly tasty. Leave them out and you have a good chana masala. Keep them in and you have something different. Something new. Something delicious. Curry leaves have nothing to do with curry powder. They don’t grind up curry leaves to make curry powder. Think of them as an Indian herb with a misleading name. They have to be fresh. Dried curry leaves taste like nothing. At best. Dust at worst. Just don’t bother. The key to this recipe – as with many curries – is the onions. Take the time to chop them finely or use a food processor. A food processor makes short work of chopping onions. Take the time it takes to cook the onions to a nice brown. That’s critical. It’s what makes a homestyle curry. There’s no way around it. Caramelized onion is good curry. Barely cooked onions is curry flavoured stew. It’s really about that simple. Once the onions are nicely browned, cooking the spices in oil makes the dish. Do that and you’re done. Just coast over the finish line. You are done. Really good chana masala is not that hard once you get your head around those two concepts. But until you do you don’t have a chance. This chana masala, as written, is a bit on the hot side. If you don’t like spicy, leave out the kashmiri chili powder. It will be as tasty. Just not quite as much zing. Serve with Indian flatbread or rice or both. Enjoy. 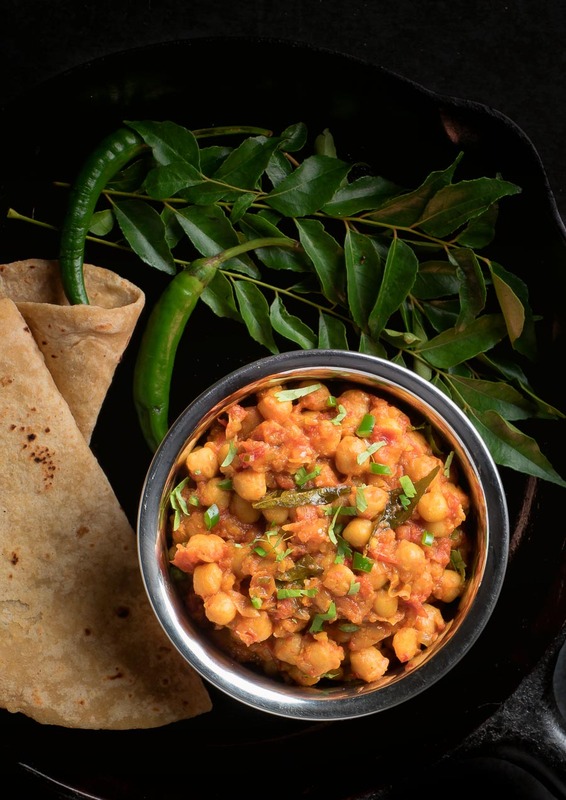 Chana masala is a great vegetarian meal or side for any Indian meal. The curry leaves are optional but add a nice South Indian touch. Don't skimp on the oil for this recipe. You need it to fry the spices. Heat the oil in a sauce pan large enough to hold all the ingredients. Add the oil and fry the minced onions until flecks of brown start to appear. This can take 10-15 minutes. Add the garlic ginger paste, green chili, curry leaves if using them and indian spice mix, salt, chili powder and cumin. Cook about 1 minute. Be careful not to burn the spices. Add the tomatoes and simmer about 10 minutes. Mix in the chickpeas and enough water or stock to keep the mixture loose. Simmer about 20 minutes, adding water or stock as needed. Add the cilantro, lemon juice and garam masala and simmer 5 minutes more. Taste and adjust for salt. If you don't want to mix up a batch of restaurant spice mix substitute 1 tsp coriander powder, 1/4 tsp turmeric and an additional 3/4 tsp cumin powder. In indian, main course, sides and stuff, Vegetarian. Bookmark the permalink. 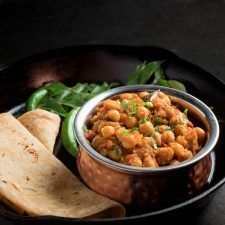 I really enjoy chana masala – even if it’s not the most conventional. It’s a great side dish, but I do like it over basmati rice as a main dish or for lunch. And this looks way more vibrant than restaurant versions I’ve had – those beautiful chiles and fresh cilantro – yum! Onions and frying the spices– this dish is guaranteed to have a ton of flavor! I love chickpeas. Can’t wait to try this! Bring on the heat! I love the “chana masala” name. I frequently replace meat with roasted chickpeas, and chana is a ways better name than just chickpea. And masala sauce . . . I can never get enough. Does the cilantro come through very strong? We are an on-the-fence family re: cilantro. We like it, but do not like too much of it, so I was trying to guess how much it comes through? 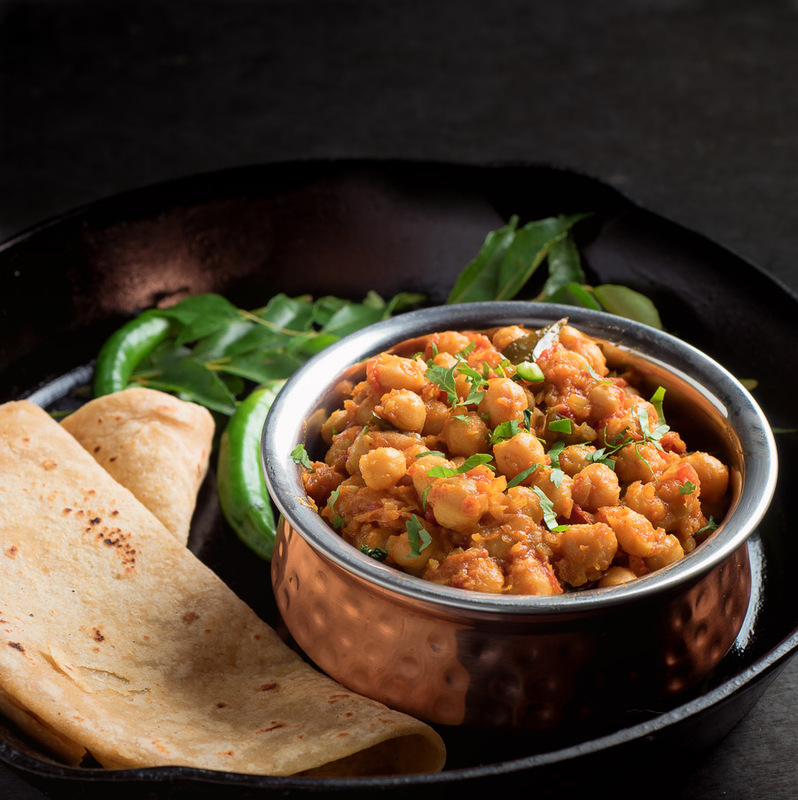 All those warming spices in your chana masala sound so delicious! I can definitely see myself eating this with a big bowl of rice, especially with the cold weather we’ve been having. Thanks for sharing! It really makes a great dinner with rice. It’s a nice side as well. It works all sorts of ways. Thanks you so much for saying so. I love chana – any Indian pulse really. So good!